HIFI Corp is a brand of Pepkor trading (PTY) LTD trading under the registration number 1963/002315/07. After more than two decades of the leading budget beater in electronic audio visual products and appliances, the brand continues to fight for consumer justice in bringing the lowest possible prices to consumers. As the Low Price champion, HIFI Corp has strategically positioned itself to save the consumer money. The company has updated its identity in line with this new positioning. 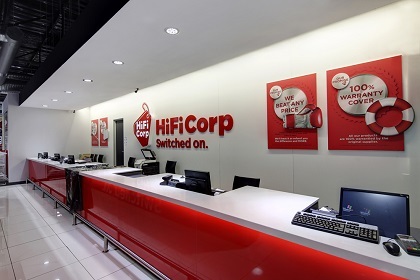 This has included a new small store design that makes shopping at HIFI Corp a great experience and also shortening the name HIFI Corporation to HIFI Corp to mirror the new focus, and adopting a new brand promise. HI-FI Corporation was most commonly referred to by customers and staff as HI-FI Corp, so it made sense to shorten the name, which also more accurately reflects the down-to-earth and approachable brand that it is. The new logo carries the same progressive yet approachable look and feel. The logo simply evolved the identity to ensure it could live in a high-street brand environment. All HIFI Cop stores will eventually reflect the rebrand, with new smaller stores supporting the new positioning. To this end stores will offer an easily navigable, uncluttered experience, with informative knowledgeable staff contributing towards empowering customers. 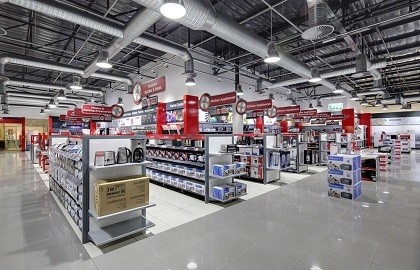 The first exciting new look ‘smaller’ store concept aligns itself to a ‘low cost’ business, further enabling the brand to offer “low prices” and a consistent shopping experience. The first of the new generation ‘small’ store concept was launched in Atterbury in April 2016 followed by Jabulani, Mamelodi and Mabopane in September 2016. HIFI Corp currently operates in the RSA, Botswana, Namibia, Zambia and Swaziland.